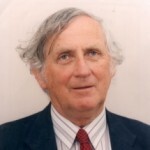 Geoffrey Norman Blainey was born in Melbourne, Australia. He is a Australian historian, author, and professor. He is noted for having written authoritative texts on the economic and social history of Australia, including The Tyranny of Distance. He has published over 35 books, including world histories such as A Short History of The World and A Short History of Christianity. He has written other books include: The causes of war, A shorter history of Australia, Triumph of the Nomads, The Peaks of Lyell, The rush that never ended, Black Kettle and Full Moon, A History of Victoria, and The steel master. He held chairs in economic history and history at the University of Melbourne for over 20 years. In the 1980s, he was visiting professor of Australian Studies at Harvard University. From 1994 to 1998, he was foundation Chancellor of the University of Ballarat. He received the 1988 Britannica Award for dissemination of knowledge and was made a Companion of the Order of Australia in 2000.